Whitening the human face for comic effect has its roots in ancient Greek theater. Comic characters were portrayed wearing white masks, while the tragic heroes were usually cast in black masks. The ancient Romans continued the tradition until, sometime after the Visigoths sacked the city of Rome at the beginning of the Dark Ages, all masks were prohibited by the Catholic church – who thought they smacked too much of idolatry and sacrilege. Players then began using minerals and plant matter to color their own faces. Among the former, white lead was the favorite way of whitening the player’s face. No one back then really knew about the potential for lead poisoning, but luckily players only daubed it on for brief appearances and then immediately wiped it off to put on another hue to play another character in the same play. Thus, they never had it on long enough for the lead to seep into the skin and enter the blood stream. All this changed during the Industrial Revolution in England. First, because the process for making white lead became much simpler. Before then regular lead bars were steeped in vinegar, then covered in dung for several weeks, during which time chemical reactions from the vinegar and the dung’s acids would turn the outside of the bar white. When the bars were uncovered the white crust was scrapped off, washed thoroughly, and made into a paste with tallow. White lead was used as a white wash and a lubricant in factories because it lasted longer and did not smolder, unlike other lubricants. So the English factory owners paid their nascent chemists to come up with a quick and easy way to make white lead paste, and they did. Heated and then sprayed with acetic acid, the lead bars turned white and began flaking without assistance. White lead was now to be found everywhere. The second change was attributable to one man, the famous English clown Joseph Grimaldi. He it was who first pranced on the stage with his face completely whitened with a combination of beeswax, paraffin, and white lead. But Grimaldi, whose ancestors came from Italy, knew a thing or two about white lead, namely that painters who used it frequently back in Italy had a tendency to literally shrivel up and die. From lead poisoning. Grimaldi had a secret oil, some say it was bergamot, some say it was rosemary, that he added to his face-whitening mixture that neutered the effects of the white lead, and so he could wear it with impunity. When Grimaldi retired he did not reveal his secret ingredient, taking it to the grave with him. 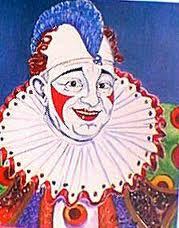 Other clowns who emulated Grimaldi’s whiteface began suffering the symptoms of lead poisoning. These included confusion, irritability, anemia, joint pain, and in some cases seizures. These are the same symptoms that children suffer today when they ingest paint chips from old houses that were originally painted with lead paint. But white lead was capricious, troubling some clowns and ignoring others who wore it constantly. The first whiteface clown in America, George L. Fox (1825 – 1877) began losing coordination in his early thirties, and by the time he was 55 he could barely walk and had to be taken in by his sister until he passed away. But the Hanlon Brothers, a rowdy family circus that toured the South prior to the Civil War, and who all wore whiteface, were never troubled by the symptoms of lead poisoning. Perhaps the most tragic victim of white lead poisoning was the Ringling clown Frank ‘Slivers’ Oakley (1871 to 1916). After rising to the top at Ringling Brothers Circus, he suddenly developed severe knee problems and had to retire prematurely when barely in his forties. When he tried a comeback several years later he collapsed in the center ring during his first clown sketch and had to be carried out. The next day he shot himself with a pistol. As early as the Second century BC, the Greek botanist Nicander voiced suspicions about exposure to lead and its harmful effects, but it wasn’t until the early 20th century, when automobiles came in to their own, and lead was added to gasoline to prevent engine ‘knocking’, that scientists as a group decided that lead in all its forms was deadly to mankind at high exposure levels. Most lead mines in America were closed down immediately. Laws were passed to remove lead from gasoline. But no one thought much about the poor American circus clown, who was still mixing up his own whiteface makeup, using mineral oil, beeswax, and white lead. And still suffering the effects of chronic lead poisoning, which, in circus lingo, was called ‘jake leg’. It wasn’t until Max Factor, a Polish immigrant who settled in Hollywood to make wigs and cosmetics, came out with his ‘Safety Clown White’ in 1920, that clowns were finally rescued from chronic lead poisoning. Having studied art in Florence, Italy, prior to settling down to the wigmaker’s trade, Factor knew that artists had eschewed the use of white lead in favor of oxide of titanium for the color white. Max worked late into the night experimenting with oxide of titanium, until he developed a formula that gave the exact same white sheen that white lead did, and he began taking his brand of clown white makeup down to the circus lot whenever a show would play Los Angeles and give away free samples to the clowns. It didn’t take whiteface clowns long before they noticed how much better they felt when using Factor’s clown white instead of their own concoction, and by 1927 every American ‘joey’ was using the Max Factor brand for whiteface. ‘Jake leg’ disappeared from the circus, never to return. Today clown white comes in many different brands, and the main whitening agent is neither white lead nor oxide of titanium, but zinc oxide – the same thing we use on bee stings and sunburn! 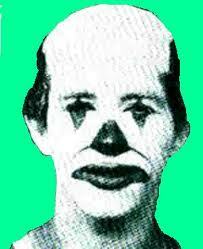 Tim Torkildson spent nearly twenty years as a circus clown. Today he works as a free-lance blogger, and is doing a study of how essential oils have influenced the theater down through the ages.